The architect who combines in his being the powers of vision, of imagination, of intellect, of sympathy with human need and the power to interpret them in a language vernacular and time - is he who shall create poems in stone. Many of the images I use on Northcrest Modern are pulled from photocopies I posses of two original P&H Catalogs from the early 60's. The original builders appear to have been three gentlemen, Walter Talley, Howard Hardrath and Paul Edwards who laid-in the roads for Northcrest under the name "THE, Inc" (from their last names, get it?). At some point early on, Walter Talley either became a silent partner or bowed out completely - leaving Paul and Howard to continue under the P&H Realty Company name (from their first names - Paul and Howard). P&H Homes, Inc began building Northcrest in the mid to late 50's and Northcrest was probably one of their largest developments. Most of the land previous to the Northcrest development was farm land - or at least grazing pastures for dairy cattle - one area was part of a pig farm. Portions of the old farm road may be seen from the back yards of houses along Regalwoods and Northcrest Road towards the northern end. I've heard anecdotally that much of the original property belonged at one time to the Embry family (no confirmation to this however). I currently have scans to two catalogs - one is an earlier 4 page catalog - the 4th page is an advert for Trane Air Conditioners - it probably dates from around 1960-1961 or so. The second catalog is an expansion to the first with 5 pages from 1963. Conspicuously, the Trane page is removed and the catalog verbiage rewritten to say "Central Heating with Optional Air Conditioning" - P&H may have omitted the AC unit to keep down pricing or may have went with another vendor. The second catalog pricing is about $400 more for each design than the first. The Trane page is replaced by two additional pages, one extolling the virtues of the Swimming Pool Association and the other page displaying a neighborhood plot map. Also, the earlier catalog only lists Howard and Paul while the newer catalog adds Tom Longino. My photocopy of the second catalog displays "Printed: 1963" in the lower left so this establishes a pricing baseline. Both catalogs suggest that there were 6 principle styles provided by the builder - however there are many additional styles, so some materials that were originally offered to potential buyers may simply have been excluded or not saved by the sources of these catalogs. Or P&H may have distinguished these 6 designs as "custom" while the rest were considered catalog or spec houses. 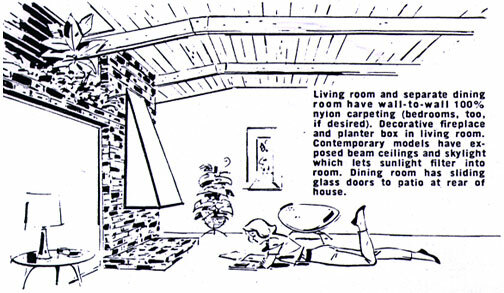 Many of the earlier-built homes do not have some of the features identified by these catalogs such as the 150 Amp service and Air Conditioning - I believe there may be an earlier catalog with additional designs. Or it may have been that P&H allowed some cuts to be made in building materials to keep down pricing. To truly understand these catalogs, one must know that at the time of printing, most homes did not come with air conditioning - only a furnace with heat. Also, traditional homes had wood-cased windows, attics, formal kitchens and no concept of a half-bath. Also during this time wall-to-wall carpet was a $200-300 upgrade - hardwood flooring was actually cheaper than carpet, and most of the sheet lumber (plywood) used today was nearly non-existent as a building material as it was fairly expensive. Further, copper plumbing had not been around long enough to prove advantageous - the more expensive galvanized-steel piping was considered longer-lasting (little did they know). The cover of the P&H Catalog features the original Northcrest logo with what I call a Phase 1 Style 1 design. The P&H Realty Company contact information on the banner at the bottom (Phone GLendale 7-0121 Doraville Ga.). Not shown in my scan, the "Nights" contact information to the right would have included both Howard Hardrath, ME 6-3246 and Paul Edwards, ME 4-8846. Note that the crown above the crest does not show in the scans I possess (I hope to get better scans shortly). This cover of the P&H Catalog also features the original Northcrest logo with what I call a Phase 1 Style 1 design. The P&H Realty Company contact information is in a taller/thicker banner at the bottom (Phone GLendale 7-0121 Doraville Ga.). Here the "Nights" contact information to the right adds a new name: Tom Longino, DR 3-8990 (perhaps he was a sales person or property manager added to the team? ).